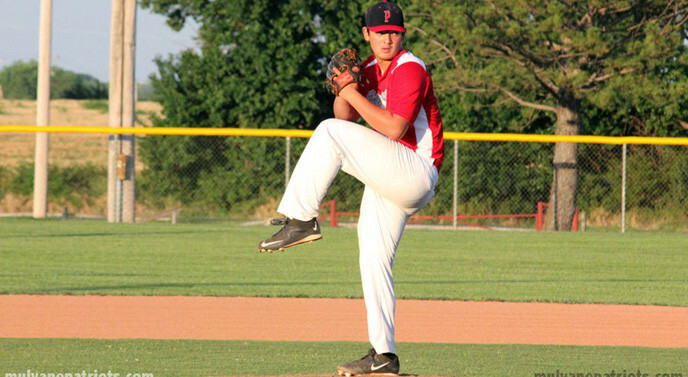 Mulvane native and high school standout Alex Evans joined the Mulvane Patriots for a game in the double header versus the Kansas Cougars on Wednesday July 5th. The Patriots had two double headers in two days, so they picked up Alex to pitch in the second game versus the Cougars. Mulvane faced off against the Kansas Cougars on July 5th and grabbed 2 wins in the double header. In game 1, the Cougars scored 1 run in the first, but Mulvane got up late in the 4th and held on in a 3-1 win. Hartley earned the loss for Mulvane. He tossed six innings, giving up one run, three hits, and walking four. The Mulvane Patriots grabbed 8 hits in the game. Tyler Sutherland, Dalton Dinkel, Michael Lawson, Caleb Cox, and Adam Brown each grabbed hits in the game for the Pats. Tyler Sutherland, Dalton Dinkel, and Michael Lawson all had 2 hits to lead the Patriots. The Mulvane Patriots grabbed 3 RBIs in the game. Tyler Sutherland and Michael Lawson both grabbed the only RBIs for the Patriots. Michael Lawson knocked in 2 runners to lead the Mulvane Patriots in RBIs. The Patriots stole 2 bases during the game with Michael Lawson and Adam Brown both recording stolen bases. In the nightcap, Mulvane got up early and held on in a 4-0 win. The Pats's biggest inning was the second inning where they scored 2 runs in the frame. Alex Evans earned the win for the Patriots. He tossed seven innings, giving up zero runs, two hits, walking zero, and had 9 strikeouts. The Patriots had 5 hits in the game. Adam Brown, Tyler Sutherland, Mike Leal, and Michael Lawson each had hits in the game for the Mulvane Patriots. Adam Brown went 2-for- 3 at the plate to lead Mulvane in hits. The Patriots grabbed 3 RBIs in the game. Adam Brown, Tyler Sutherland, and Dalton Dinkel each had RBIs for the Mulvane Patriots. Adam Brown, Tyler Sutherland, and Dalton Dinkel all had 1 RBIs to lead the Mulvane Patriots. The Pats stole 2 bases during the game with Michael Lawson and Javis Larson both recording stolen bases.